I've grown to love two and three word titles that seemingly have nothing to do with each other. My girlfriend was here last week from Upstate New York. 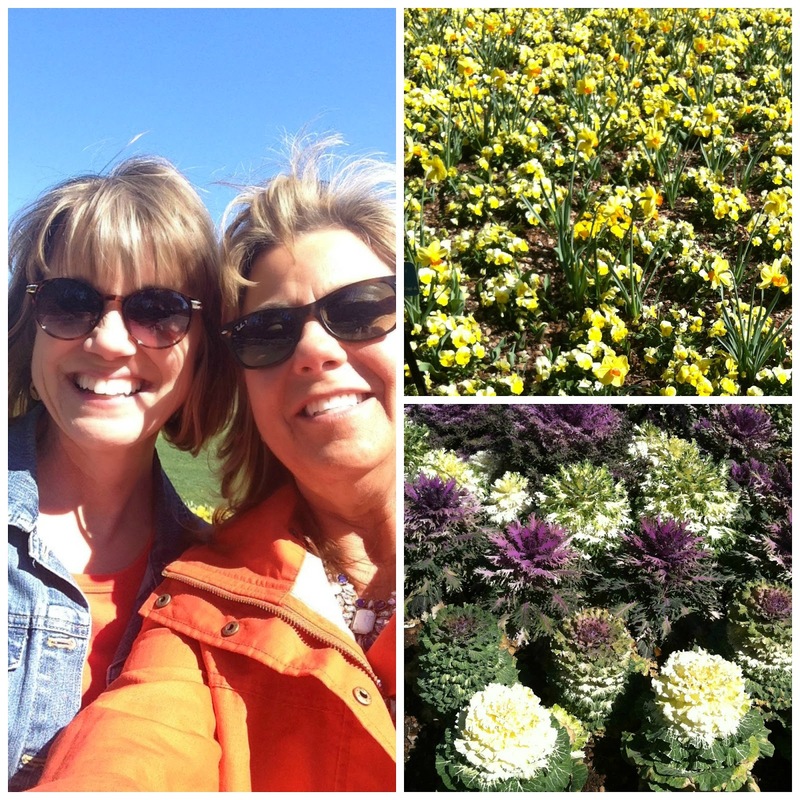 and went to the Dallas Arboretum. Love this girl! an onomatopoeic word that would describe hot flashes. Why? Well, let's just say that my sweater flies off in a flash, my leg sticks out of the covers at night, and thank goodness for clothes that zip because they come off faster!! You could say that I'm "sizzling" and my clothes "zip" right off. You understand, right? I'm constantly saying, "Is it hot in here or is it just me?" Go there fast and get these cuties! They are adorable and comfortable. What more could you want for spring fashion? After the beautiful week we had last week it is icy here today. Stacey, I'm sure you and your girlfriend had an amazing time! I love hanging out with old friends like that! We always pick up wherever we left off! Hope you're staying warm, as well! It's icy out there! I bet your New York friend loved that weather!! Your shoes are super cute and I am drooling over the fact that you are not wearing socks! Although it sounds like you might be craving a little bit of my subzero weather right about now. Hang in there! Love the Arboretum! Thanks for sharing some color on a cold day! St. John's Wort....3 times a day, and Black Cohosh...1 in the evening...works for me!! Sounds like you two had fun and that is a great thing!! Glad you are feeling better...sorry about those hot flashes! :-( I can't wait for the weather to get a bit warmer here so I can visit the local gardens. Spring can't be far away! How nice that you were graced with such good weather for your girlfriend's visit! We were at 80 yesterday and now it's 40. Lol! It's great to have friends that you can pick right back up with, like you were never apart. Love those shoes too! Love the pic of you and your friend....I am thankful that I am through the hot flash stage! Love the striped shoes they are too cute, oh my yes I know about the hot flash too well. Never had a friend like that..sounds wonderful to have one. Glad you had a wonderful time. I'll be bewailing the big 60 this June. I've noticed that the night sweats and anxiety attacks have leveled off, and I can still add, subtract and balance my check book. It isn't as bad as I thought it might be especially without the meno symtoms. Think possitively, think positively, thin..........You've got many good years to go. Glad you had fun with your friend. I have some back in Texas I'd love to see. Hi Stacey! So good to know you're feeling well enough to get out and paint the town with your friend. Poor thing, I do understand about the hot flashes. I'm almost finished with that stuff but my leg pops out from under the covers almost every night! I'm glad you had fun with your friend. I guess I'm on the other side of the dreaded menopause. I don't get to wear cute shoes...Sigh. That sounds like a great time with your girlfriend and I'm sure she was happy with the mild weather too. Love your new shoes. So cute. I need to check out the shoe dept. next time I'm at Target. Your post made me smile. Good friends and cute shoes can make up for a lot of not so fun stuff. I think anyone who can use onomatopoeia to describe hot flashes deserves a happy day! Have not experienced hot flashes...I guess that is a good thing...My mom never did, so I am hoping that I will be following her lead....glad you had a great time with your friend...and hope your ice is not coming our way...we had a horrible time with it last week. Cute shoes! Hot flashes or as I like to call them "private summers" are a force to contend with! It's so cold up here in OKC that I bet you would be comfortable here while flashing! Sounds like you had a great time with your gal pal...I've always wanted to visit the Dallas Arboretum. I'm so counting the days until Spring! Awww! Good for you! Sounds like your girl time was fun. Cute shoes! I need some comfy flats. 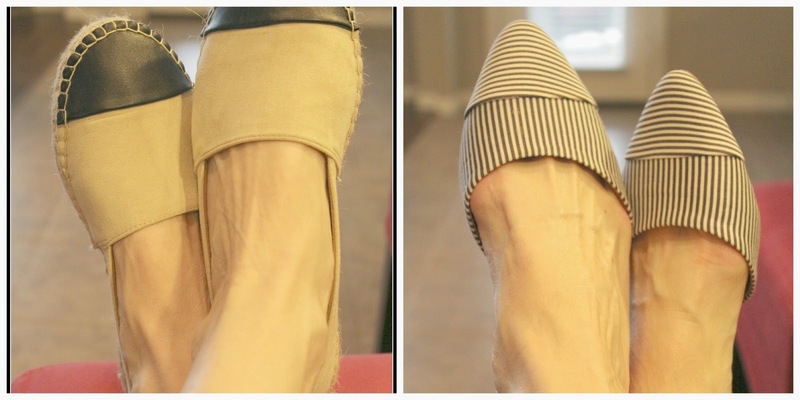 For some reason flats are uncomfortable to me except for Toms... but I need dressy flats. I'll check Target. Hot flashes ... my family could tell you some stories about me! It happens in a second and yes! Hopefully there are layers to come off! I've learned how to sleep half covered... as long as my feet stay cold I can manage. Oh the joy of it all :-) Glad to see you're back! I like the thought of those cute new shoes, better than I do the memory of heat flashes:) The picture of you and your friend is so good! Friendships make life better! Dressing in layers has been my routine for awhile now. So nice that you had a visit from your wonderful friend - it's such a pick me up! Very cute shoes, too!! Looks and sounds like a fun day for you and your dear friend. Love the pic of you two!! You girls enjoyed the nice weather before being iced in here in Dallas. Today is more of the same here with the ice. Schools still closed but businesses reopening. Have to say, I can't help with the hot flashes. I flew through that time and never had one. My mom never did either, I guess we were lucky! I hope yours end quickly. Love the shoes. I was just at Target last week and did not see them. I'll have to look again. Cute shoes Stacey and looks like you had a great time with your bff! I bet she enjoyed the weather in Texas. Ughhhh hot flashes been there done that!!! This too shall pass. You and your friend look so happy! Hurray for old friends! I feel bad for you with the hot flashes...mine seem to be a way of life. Between menopause and a haphazard digestive system, I'm never sure what causes me to feel like I'm in a tropical forest. I know it will never end but like you, I know I came out on the good side. Love the shoes! Especially the pointed toe ones. I like the open sides and I think pointed toes make me look taller. Ha! Have to look the next time I'm there. It sounds like you had a great time, Stacey! I don't get hot flashes (my Mom didn't either) but I would love to sleep through the night again. I must wake up about 4 times a night and then I'm pooped by 3 p.m. the next afternoon. Are you taking or on anything (hormones)? I'm on a low dose patch and I'm not sure if that helps with any other symptoms I would have. Right now not sleeping well is my main complaint. What a sweet picture of the two of you. It brought a little tear to my eye as I realized I'm needing an "old friend fix." I'm so happy here in SC and I've made some good friends but they aren't old ones yet! LOL! Those shoes are from Target? Oh my! I hope they have some here!